Nine-month-old Macy Padon practices clapping her hands, a skill she recently has become intent on learning. Macy and her parents, Joe and Lauren Padon, are one of many children and families that benefit from Horizons' Early Intervention and Family Support programs. Craig — Macy is as happy and curious and eager as any 9-month-old. She hardly seems to notice that she’s been stuck in a cast that keeps her legs stuck straight out from her hips in a frog-leg position for the past 3 1/2 months. Macy was born with Down syndrome and is one of dozens of children and families that Horizons Specialized Services has helped through its Early Intervention and Family Support programs in 2014. Horizons’ annual Little Points of Light campaign is underway this month to raise money to support these two programs, which largely depend on individual contributions as well as grants and state funding. Last year, Moffat County donors contributed nearly $10,000 to the campaign. Horizons serves a five-county area in Northwest Colorado — including Moffat, Routt, Rio Blanco, Jackson and Grand counties — providing services to children and adults with intellectual and developmental delays and disabilities, as well as their families. For Macy and her parents, Lauren and Joe Padon — both teachers for Moffat County School District — the support provided by Horizons has been invaluable. 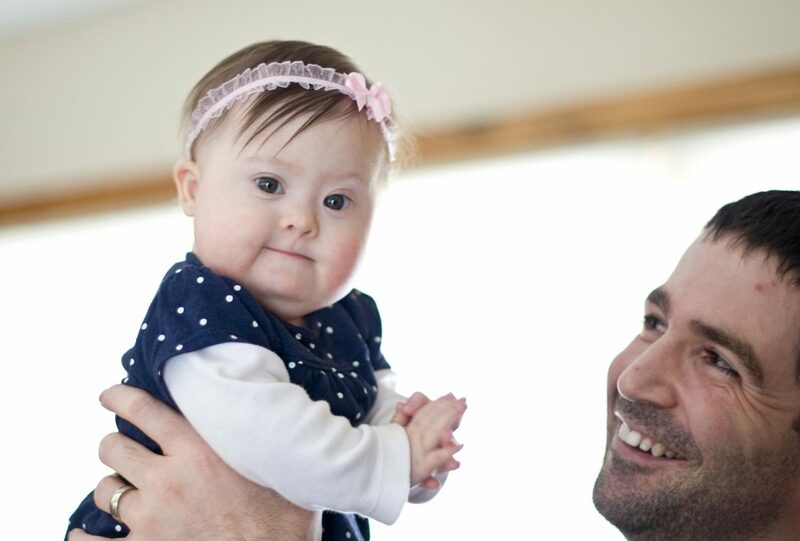 Macy’s Down syndrome was a surprise to the Padons when she was born in March. A heart murmur and two small holes in her heart — a common condition for babies with Down syndrome — put her on a Flight for Life to St. Mary’s in Grand Junction. By the time Macy was 2 weeks old, Horizons had contacted the family and met with them. The Padons immediately were enrolled in the Family Support program, which offers monthly reimbursement to help offset the cost of the family’s trips to Grand Junction every 10 days to care for Macy’s heart and her hip dysplasia, another condition common to babies with Down syndrome. Horizons also enrolled Macy in the Early Intervention program, providing her with occupational therapy once per week to help her achieve developmental milestones such as learning to lift her head. When the time comes, the OT also will help her develop speech and language skills. The needs of a child with developmental disabilities can be costly. The average monthly cost for early intervention services per child in Colorado is $561, according to the 2013-14 Annual Report from Colorado Department of Human Services Office of Early Childhood. However, it pays dividends: 98 percent of kids with significant delays who received early intervention in Colorado last year showed improvement, according to the report. At the beginning of 2014, Horizons had 50 kids enrolled in their Early Intervention program agency-wide, 13 of whom resided in Moffat County. The Family Support program had 87 families enrolled agency-wide, with 20 families enrolled in Moffat County. The Family Support program was created by Gov. Roy Romer in the early 1990s to help families stay together despite the financial and emotional stress of raising children with disabilities. “Statistics showed that families raising children with developmental delays and disabilities had an 87 percent divorce rate — much higher than for families not raising a child with special needs,” Pepin explained. For the Padons, the support has had a tremendous impact on them and their little girl. They also expressed immense gratitude to the community for its support. To donate to the Little Points of Light campaign, visit http://www.horizonsnwc.org or mail a check to Horizons, P.O. Box 1483, Craig, CO 81626.